Chicago The Musical slot is from High 5 Games (H5G), who are as well known for making games for IGT as they are for making games under their own name. One look at this musical-inspired slot and you could easily mistake it for an IGT title, with its sharp graphics and crisp sounds that feel very familiar. 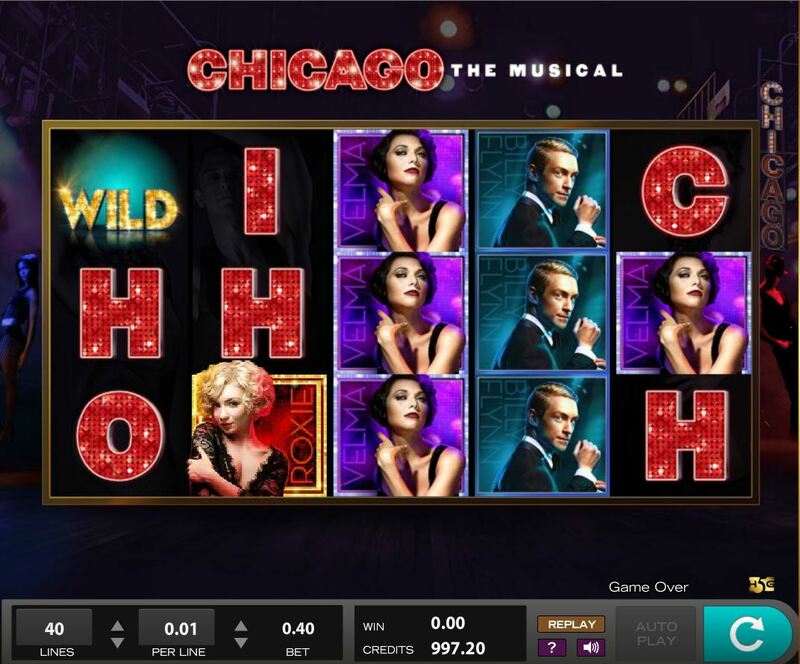 Chicago The Musical has no resemblance to Novomatic's gangster-themed Chicago slot as the title makes clear. We have a polished production based on the Broadway play and a backdrop of Jazz Club music from the era. So will the game have you singing? You start this play by seeing 5 reels of 3 rows and get 40 pay lines. The 3 main characters of Roxie, Velma and Billy Flynn are the most valuable paying 2.5, 2 and 1.5x bet respectively for a 5-of-a-kind with the 6 different letters of 'CHICAGO' making up the rest at 0.25x bet for the 5. These appear singly unlike the characters which are stacked as are the 'Be good to your Mama' Golden scatters of which you need the full 9 on the centre 3 reels to trigger the game's bonus round. 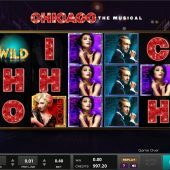 Chicago The Musical slot like H5G's Purrfect has 'super stacks' on every spin too, one character symbol or the standard Wild on all 5 reels is randomly selected for super stacks to increase winning chances. Randomly you may see stacks of white fluff appear on the reels on some spins - this is the mystery symbol and if they land in view they will reveal a random character or Wild which will hopefully assist in getting a win. You can land the Cast Wild as scatters on the centre 3 reels for 25x your bet. Land the Billy Flynn ones the same way for 250x your bet. Get really lucky and hit the 3 Velma Wilds for 2500x bet. If you hit the 3 Roxie Wilds then be prepared for a massive 10,000 x stake! If the Wilds of any type land mixed they pay as standard Wilds. You may also get a random feature where any symbol on the centre reels may turn Wild. There are also 3 single Broadway Bonus scatters on the centre 3 reels. These trigger a trail climb of 10 levels. Each has 9 blank posters and you reveal one - if it's Velma you climb the ladder one rung, Roxie does the same and you can get a 'Combo' poster with both Velma and Roxie which has them climb one rung each. Hit Billy though and you collect Velma and Roxie's progress and their accumulated cash prizes and the ladder trail ends. Get to the top level and be prepared for some big cash multipliers! Having hit the 9 Be good to your Mama scatters on the centre reels you will be shown 4 picks, each of which reveal 1-4 free spins thus you can get any amount from 4 to 16 in total. Each scatter landing in these free games will add one extra spin too. You get enhanced reels with more Wilds and characters present.